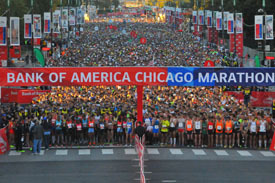 The Chicago Marathon has become an iconic event and you and your guests can treat yourself to a V.I.P. Chicago private yacht cruise on Lake Michigan and overnight stay aboard Adeline’s Sea Moose. Consistently voted among the world’s top five marathons in most rankings lists, the Bank of America Chicago Marathon is equal parts spectacle and world-class race. If you don’t consider yourself a runner, you can still enjoy the marathon by joining spectators or more than 100 volunteer groups in all the action.